Exciting banners and 2000 children. Wow!!! I'm not sure if I should be surprised that Jeremy brought sandals to snowy Marines. I see in the forecast for Marines for this week a lot of snow spinning! It's going to take more than a few inches of snow to get a Coloradan out of wool socks and sandals. Comfy! Sorry, 2000+ general visitors after the 150+ school kids so far. Found on youtube a video of Emma(nuel) doing a presentation to school children. You can see Attila pacing on the right, probably ready to do a demonstration. Looks like early in the morning, with few of the players at the venue. I just whant to thank everyone at Marines Festival such a warm wellcoming, I enjoyed every minute of it!! Thanks Mermouy, Emanuel, Ludo and families for the food the venue decoration... for taking care of me so well!! To all all the people attending the festival, you are great players and better people. It was great sharing a couple of days with you!!! Marines 2019 spintop festival.. it was way better that anything I could have dreamt of!! people and i am already looking forward to seeing you all again soon! Festival brought many gratifying responses to my tops, and better yet, many new friends from Europe and the Americas. 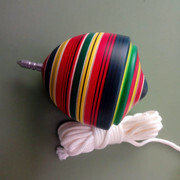 Much to its credit, this forum beings together a welcoming and vibrant community of spintoy enthusiasts of all kinds. Many thanks to Ludo and his wife and daughters for taking such good care of us -- and for their willingness to translate whenever I needed it. He's lucky to have such a wonderful family. I left them all some tops. Back to Paris tomorrow with Jim, whose endless help and fun company I'll always remember fondly.Then off to see Cyril and his collection on Tuesday. Can't wait! I sounds like another great festival! Yes, Ludo's family is top notch! I'm very glad that this forum has helped the community come together. I'm also happy that this year ITSA could directly support the festival. I'm sorry I missed seeing and meeting you, guys. I hope to make it next year to Marines+Loon. I took lots of video . It will take some time but I plan to put something together. It is tough to write to much on the phone but I also would like to say thanks to Ludo and everyone at the event that made me feel at home. Right away I was made to feel like an old friend. The support for my tops was amazing so thanks to my patrons. Watching people using one of my tops and figuring out a new trick made me feel like I am on the right path. I am sure I will misspell people's names. Ludo, karin, Leela, Sara, Sham, Damien, Quentin, Christoph, Pepe, Wilson, Murmouy, Emanuel,Atilla,Jeremy, Jim and Chrstian are names that come to mind. THANKS! Jose is being modest. Everyone played his tops -- seemingly whenever they could get their hands on one. The air was always full of Relampagos! I see a couple of platforms (one very tall) for Taiwanese target shooting: very nice! Even Pepe, coming for the first time was demonstrating some diabolo tricks! Wilson demonstrating the spintop trick called "yoyo"
The banners are truly spectacular! ....and 2000 attendees. Wonderful! Thanks for the videos. It's great to have so many skill sets in the same place, exchanging ideas and inspiration. Those who are going to visit Cyril tomorrow are in for an awesome experience. containing a mix of acids to create an electrolyse ! last question i heard in the car: who is going to be the next special guest in marines ?